Spring is beginning to awaken the Montreal landscape – daffodil and crocus buds are ready to bloom and crisp green tulip stalks push through the thawing earth. With this happy hint of seasonal color in mind, we decided to amp up the brilliant tones of the spring table at our La Cache store in Westmount. I love layering cloths so our pretty round table is set with a base of the Papillon Jaquard Breakfast cloth. Over top is the joyous Fiesta Plaid (also a breakfast cloth) – the rich turquoise blue, magenta and yellow weave really catches the eye! Quilted placemats in the Paisley Bouquet Pink collection pick up the rosy hues in this tablescape while the scalloped edges add further texture. The dusty rose dishware is vintage-inspired and newly available in our boutique, as is the blue glassware – not a combination you would immediately think to pair but the tablecloth really pulls it all together beautifully. Of course my love of birds is revealed in the Hummingbird watering can and dove tea cups and don’t you think the whimsical turquoise beaded lamp adds just the right mood lighting? Time to sit back and enjoy summer lemonade in anticipation of the season! 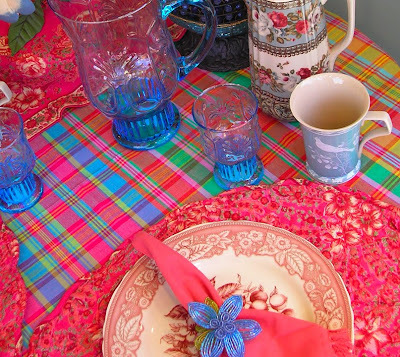 I really like the pink and blue together- fun, cheerful table! Beautiful tablescape, April! So very colorful! I love the tablecloth and especially love the dishes! Just awesome! So glad i discovered your product line and your blog! This is so pretty! Need to buy some cloths for my Teas! I looked and looked and looked for a more descreet way of telling you, but couldn't find another form of contact. I love your stuff so much, so I want you to look good. On AprilCornell.com girls' home page there are 2 typos on the Tip From April. "your" should be "you're" and the word "way" is missing from "a fun way to stay warm". I am so sorry to put this out in such a public forum, but there was no other way to reach you and I couldn't let you look bad. Delete this post if you can! This is beautiful! I love your linens, great designs! I have a few of your napkins! Welcome to Tablescape Thursdays! It's great that you could join us for Susan's popular party. Thank you for sharing this inspiring table. I think it would look perfect transported to Susan's beautiful screened porch! Your pure, fresh, bright colors radiate warmth and positive energy! The layering and juxtaposition of patterns creates an exotic effect. The vintage-inspired items keep things familiar, cozy, and inviting. The watering can and beaded lamp are wonderfully whimsical! The napkin rings provide the perfect festive finishing touch! Again, thank you for joining us! I loved using your linens on my table this week. The comments have been gratifying and overwhelmingly complimentary of your wonderful designs! Beautiful April...I especially like the little floral pitcher and placemats. Very inviting and lovely. Oh, I love this color combination...the rose and blue together are really stunning! The darling hummingbird watering can totally stole my heart! 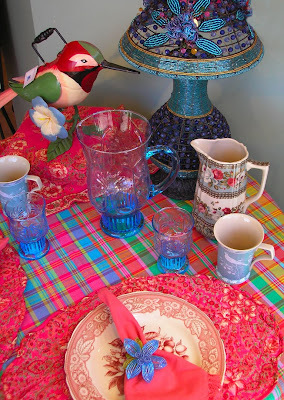 I am a huge bird watching fan...so this tablescape is a delight! I, also, love the pitcher I see just a hint of...beautiful! Oh how beautiful and festive! Love the almost shocking colors of Spring. It certainly casts off the blues of Winter! What a beautiful tablescape. I too love humming birds. Everytime my sisters and I see one we always think of our mom as it was her favorite bird. So we always hello to our mom when we see one. Sadly our mom passed away many years ago. Your tablecloths and napkins are so wonderful. I love your linens. Your colors are perfect. Thank you for sharing. I thought I posted a comment this morning, it must of gone into a black hole!! Lovely tablescape, I love all your vibrant colours, very cheerful. Is it possible to buy your products in the UK? I have bought the book you suggested. Thank you for visiting my blog. I love the colors, so pretty, the blue with the bright pinks. Thanks for sharing. Wow, lots of colors..love the blue glasses with the blur plaid cloth! I saw your wonderful linens on Bill's blog last week and would love to know where I can buy them over here in Europe. Your Tablescape today is just gorgeous, I think it all works splendidly together!! I've just signed up as a follower. Hi, and welcome to Tablescape Thursday! What a treat to find you here amongst the bloggers. 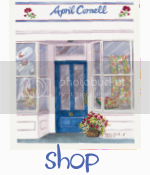 Your linens are scrumptious; I used to dream over them at a little shop out in Southold Long Island, near our beach house, but then the shop closed -- I need to find another source! Love the colors -- love the layers of cloth and pattern and texture. Hmmm... I have a big round table in my conservatory in my old house that would look fabulous layered like this! Thanks for the inspiration.